The Antonov An-124 Ruslan (Russian and Ukrainian: Антонов Ан-124 «Руслан») (NATO reporting name: Condor) was the largest airplane in production until the Antonov An-225 was built. During development it was known as the An-400 and An-40 in the West, and it flew for the first time in 1982. Civil certification was issued by the CIS Interstate Aviation Committee on 30 December 1992. Over forty are currently in service (26 civilian models with airlines and 10 firm orders as of August 2006) and 20 were in commercial use in 1998 in Russia, Ukraine, the United Arab Emirates and Libya. 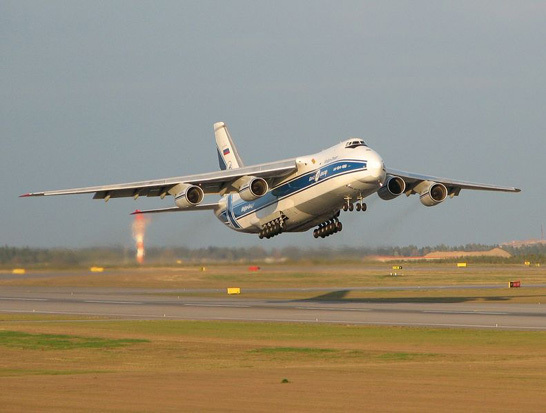 The An-124 was manufactured in parallel by two plants: the Russian company Aviastar-SP (ex. 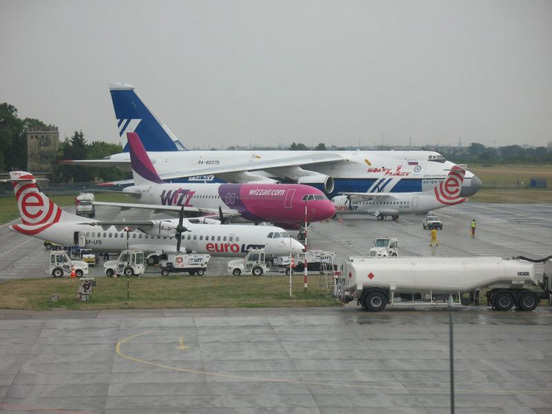 Ulyanovsk Aviation Industrial Complex) and by the Kyiv Aviation Plant AVIANT, in Ukraine. 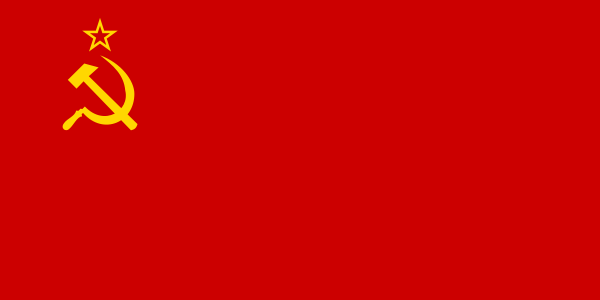 Series production ceased with the break up of the Soviet Union. The last five unfinished airframes left from the Soviet times were completed in 2001 (1), 2002 (1), and 2004 (3). While currently no An-124 are being produced, Russia and Ukraine have agreed to resume the production in the Q3 2008. 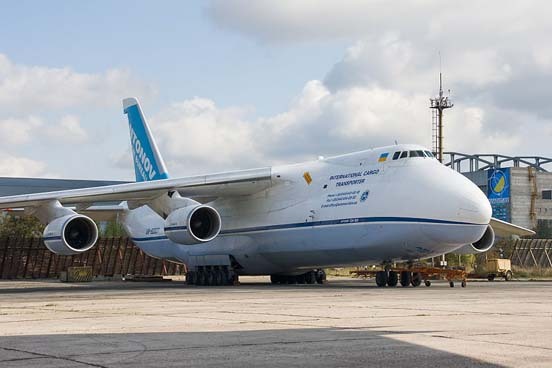 Physically, the An-124 is similar to the American Lockheed C-5 Galaxy, but has a 25% larger payload, and in lieu of the Galaxy's T-tail, the An-124 uses a conventional empennage, similar in design to that of the Boeing 747. 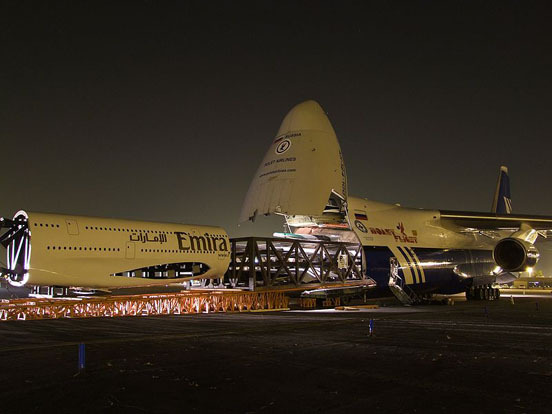 An-124s have been used to carry locomotives, yachts, aircraft fuselages, and a variety of other oversized cargoes. 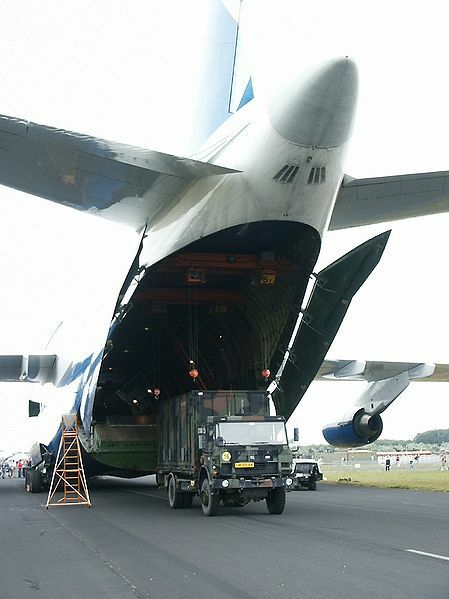 The An-124 is able to kneel to allow easier front loading. Up to 150 tonnes of cargo can be carried in a military An-124: it can also carry 88 passengers in an upper deck behind the wing centre section. However, due to limited pressurization in the main cargo compartment (3.57 PSI) , it seldom carries paratroopers. Since the type was initially designed for only occasional military use, original An-124s were built with a projected service life of 7,500 flight hours with possibility for extension. However many airframes have flown more than 15,000 flight hours. 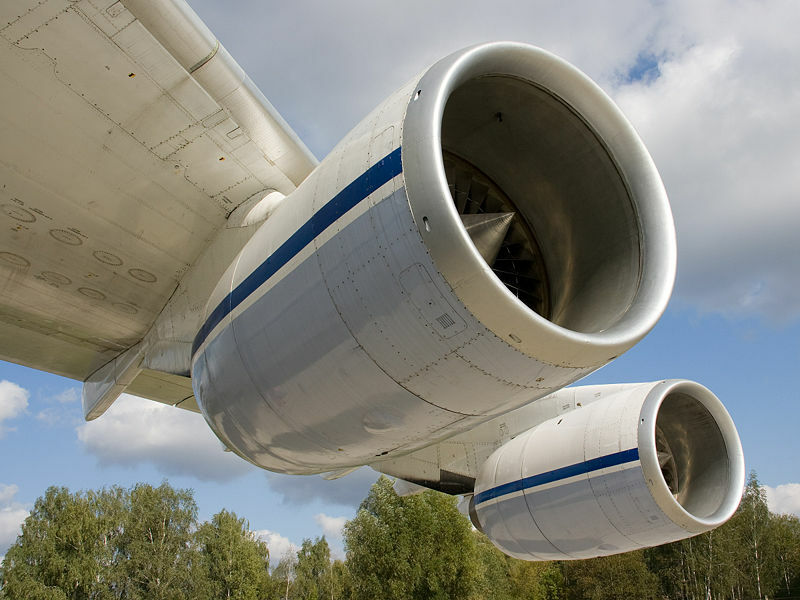 In response to complaints by commercial users, that aircraft built after 2000 (the An-124-100) have an improved service life of 24,000 hours, older airframes are being upgraded to this standard. The works on its extension up to 40,000 flight hours are being performed. The Kyiv Aviation Plant AVIANT offers upgrades to the АN-124-100М-150 version. In May 2008, at the Berlin Air Show, it was reported that the governments of Russia and Ukraine were closing in on final details to restart production of the An-124. The new variant, to be known as the An-124-150, will feature several new features including a maximum lift capacity of 150 tonnes. However, an announcement by Antonov's parent, United Aircraft Corporation in May 2009 does not include any planned production for An-124s in the period 2009 – 2012. Germany led the recent effort to lease An-124s for NATO strategic airlift requirements. Two aircraft are leased from SALIS GmbH as a stopgap until the Airbus A400M is available. 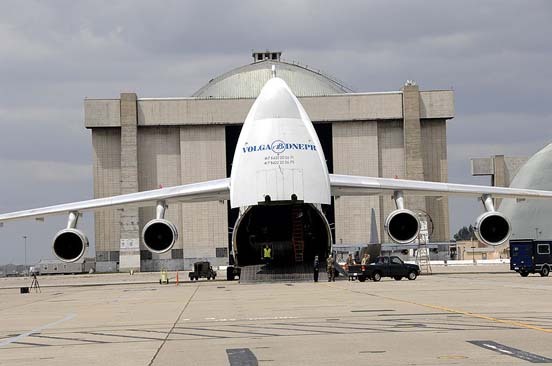 Lockheed Martin contracts the An-124 to transport the Atlas V launch vehicle from its facilities near Denver to Cape Canaveral. Two flights are required to transfer each launch vehicle (one for the Atlas V main booster stage and another for the Centaur upper stage). On May 1987, an An-124 set a world record, covering the distance of 20,151 km (10,881 nmi) without refuelling. The flight took 25 hours and 30 minutes; the takeoff weight was 455,000 kg. The previous record was held by B-52H (18,245 km). In July 1985, an An-124 took 171,219 kg (377,473 lb) of cargo to an altitude of 10,750 m (35,270 ft). An An-124 was used to transport the Obelisk of Axum back to its native homeland of Ethiopia from Rome in April 2005. The shipment was done in three trips, each carrying a third of the monument's 160 tons and 24-metre (78 ft) length. Modifications were done to the airstrip at Axum in order to accommodate such a large aircraft. 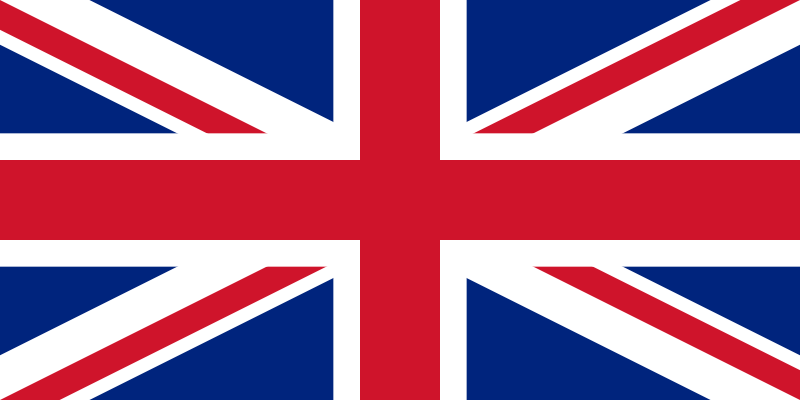 Joint proposal with Air Foyle to meet UK's Short Term Strategic Airlifter (STSA) requirement, with Rolls-Royce RB211-524H-T engines, each rated 60,600 lbf (264 kN) and Honeywell avionics. STSA competition was abandoned in August 1999, reinstated and won by Boeing C-17A. In August 2006 a total of 26 Antonov An-124 aircraft remain in airline service, with a further 10 firm orders. Libyan Arab Air Cargo: 2 in service. Volga-Dnepr: 10 in service; 5 on order. Polet Airlines: 8 in service; 5 on order. Antonov Airlines: 7 in service. Maximus Air Cargo: 1 in service. CCCP-82002, operated by Antonov Airlines crashed near Kiev, Ukraine on 13 October 1992 during flight testing. 8 fatalities. RA-82071, Operated by Aviastar Airlines crashed into a mountain at 11,000' while in a holding pattern at Kerman, Iran on 15 November 1993. 17 fatalities.